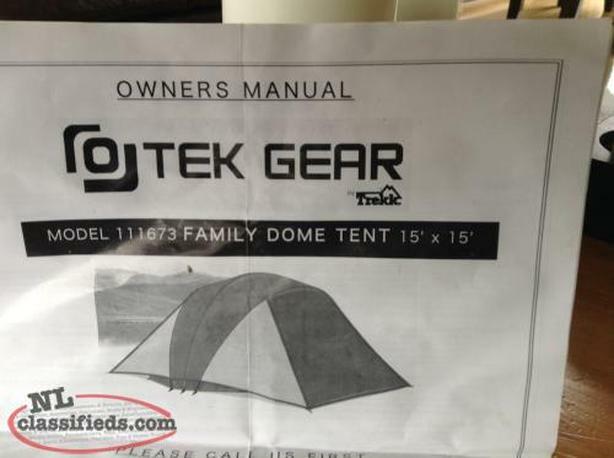 Large 15' x 15' Tent for family camping. We used this to camp with small kids. There was plenty of room inside even with a queen-size air mattress and a playpen, and all of our bags. Front and back doors make this nice for late night trips to the outhouse. No holes, all zippers in great shape, all collapsible rods good. Would recommend sheltering with a tarp (like in the picture) if camping in rainy weather.